Spire shows off the Star LED, a new fan series available with blue and red LEDs. Available in 80mm, 92mm and 120mm versions, these fans are offered with sleeve bearing, ball bearing and nano bearing. The 120mm version has an airflow of 51.12CFM and a noise level of 10 to 23dBA. Pricing of the Redstar 120 LED PWM fans is $12.99 / 9.95EUR for the sleeve bearing, $14.99 / 11.95EUR for the ball bearing and $19.99 / 15.95EUR for the nano bearing version. 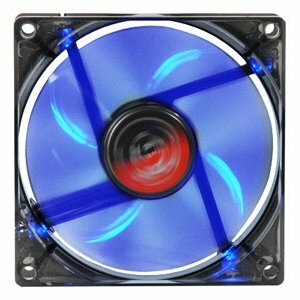 Introducing the Spire Star LED fan series, the Star series consist out of RedStar & BlueStar LED fans which are high quality, LED colored and silent cooling fans for the PC gamer. Based on the new Star fan blade design these LED series are destined to provide good airflow at silent noise levels. Top of the line components and features are applied to build these powerful LED fans. The Star series LED fans feature PWM which automatically controls the fan speed between 600~1200 rpm, according to the computers temperature. This ensures that the fan is as quiet as possible at all times and automatically adjusts to meet your systems cooling needs. To make this fan series extra silent we have included 4 rubber anti-vibe mounts to install the fan and stop any fan vibration. Trust the brand with the industry leading experience, Spire.